Op-Ed: Could Strategic Fit be the Answer to Some of Our Sourcing Problems? In the global fashion industry we hear so much, are taught so much and publish so much about strategic sourcing. Additionally we discuss strategic pricing, strategic marketing, strategic buying, strategic planning and even strategic supply chain management. In 30 years of garment industry work, I have heard all these expressions countless times, and particularly more so in the last five to 10 years. In all of this strategizing, we have created a cycle of fashion that is fast, price-driven, habit-forming and wasteful. We know this. That was our strategy—to speed it all up. And if we were to slow down, well, where in today’s computer-aided fashion production world that is sourcing, buying and planning so strategically would we slow down? We have perfected the cycle with so many digital steps that just going slower doesn’t make sense. There is nothing strategic behind that. So, where, how and in what part of the cycle could we slow down? Well here’s a thought: How about we slow down in the fitting? In all this talk about strategy, why aren’t we talking about strategic fitting? We have an increasing number of consumers not finding clothing that fits. And what is the strategy behind that? Fit is important. My generation was taught a quality garment should fit beautifully. In the ’80s we had a commitment to fit. We worked hard so that the clothing we manufactured fit well on the body in terms of size, comfort and contour. We learned a good-fitting garment will not slide, shift, pinch, pull, bag, droop, or hike. A good-fitting garment is flattering on the body; sits perfectly across the shoulders, around the neck, under the arm, at the waist, across the hips, through the crotch, and down the legs. Side seams must be perpendicular to the floor, waistlines parallel. No excess fabric should bring emphasis or direct the eye to any areas we do not wish to be emphasized. And, above all, a good-fitting garment should feel good on our bodies, putting on a well-fit garment feels truly special. That was our goal, and it took quite a bit of time. I learned early on that regardless of your brand’s competitive advantage—without an attention to fit, you will get returns. The truth is we have lost our attention to fit and we are getting more returns. In 2015 alone, $62.4 billion worth of apparel and footwear were returned due to incorrect sizing, according to a Body Labs report. Additionally, it is a fact that an increasing number of consumers are not finding clothing that fits. In a 2013 Iowa State University study, it was found that 63% of women questioned could not find clothing that fit well at retail, and 57% of women responded that they did not fit into today’s sizing standards. In all this talk about strategy, why aren’t we talking about strategic fitting? Why are we satisfied with these stats? And, again, what is the strategy behind producing an increasing amount of clothing that does not fit? The fact that so much clothing lining the racks of our retail stores does not fit well is yet another effect of fast fashion. We used to spend time making sure a garment fit well on the body before producing it. After our concept was designed, a patternmaker draped or drafted a pattern of our design by hand—for a fit model, whose body was measured by hand. A sample was made, we put the sample on a fit model and he or she told us how it felt. We revised the fit based on how they felt and what we saw, and advised our list of corrections to our patternmaker. The patternmaker adjusted the pattern accordingly, a revised sample was created, we put that new sample on a fit model, and he or she told us how it felt, we corrected the fit again and worked with our patternmaker again. The cycle went on until we got the fit perfect. The average amount of samples created back then was five. Yes, that is quite a number, however what arrived at retail, for the most part, fit beautifully. Quite different in comparison to today’s strategic sourcing model, where the factory handles many of the steps we had so lovingly performed in our designer sample rooms. Add to this, the fact that many of the new steps are completed with technology. Therefore, in terms of fit, many of the fitting steps are now completed either off-site or in the cloud. Bodies can now be measured with 3-D body scanners. Computerized patterns are created in CAD and pattern pieces can be virtually assembled on the screen and even viewed on a virtual model or avatar where you can revise the fit there. Move the waistline up, the virtual pattern pieces are corrected. A sample is then cut and sewn for one formal (and final) fitting- at times, still on a live fit model or at times on a dress form, whose measurements are based on 3-D body scans. The fact is that a real fit model is rarely putting on and commenting on how to correct the fit. If this is done, there is only one fitting, where corrections are noted, advised, corrected in CAD, and then off the garment style goes straight to production. Yes, the garment arrives in the store fast and cheap—that is the goal, but the garment does not fit beautifully. It cannot, due to the time necessary for a great fit was not invested. 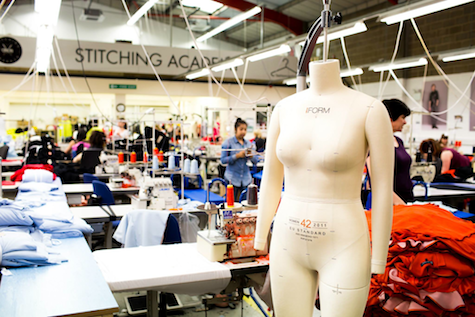 An industry focus on strategic fitting could help reduce the increased returns, as well as the increased retailer markdowns and chargebacks that are caused due to the changes technology has created in the fitting segment of the production cycle. We must consider the longevity of our product. In all our talk of sustainability, we must look at fitting as well. This segment of the cycle causes clothing to be disposable and is therefore another of the many reasons our landfills are rapidly filling up with clothing that is bought and discarded after an average of five wears. And a look at the future of fashion software shows yet more advancements in cloud-based CAD services in terms of more sophisticated patternmaking, fitting, and avatar usage. The result is fit may suffer more, as when we view a garment on a 3-D dress form or on a virtual model, we lose the human touch. The human who was trying on the garment, was standing, moving, and sitting in that garment, who advised us if the back neck felt uncomfortable, or the armholes felt high, or the pockets were too shallow. We are losing that personalization and interconnectedness with our garments. With fitting just one sample—instead of the previous five, whether we put a garment on a human or not—we miss the opportunity to fine tune a pattern and attend to the details big and small that create a garment that feels so good on the body. Along with fit, we also lose a great deal of styling, as without an exquisite attention to fit, we cannot create styling that is exquisite. That type of styling takes time and takes samples; so rather we choose to create an excessive amount of variations of the basic styling. We need to truly consider how we fit our garments. We need to consider how to bring back the art of fit and the art of a fit model. The time, staff and money to create three, four, or five fit samples per style is a cost we do not want to spend, but maybe being strategic here is the ultimate strategy to save our businesses. Strategic fitting needs to be done locally, close to design. Perhaps we need to create and encourage the use of collaborative centrally-located sample rooms, with shared patternmakers and fit models, who can be booked by the season, style, day, or hour. Or could we conceivably ask our factory groups to set up small local sample rooms, where they can directly handle the patternmaking, sample making and fitting stages of the goods they will be producing, where we are close by and can comment on the fit through a rapid series of fit samples. Can we do this? Those are two options where the costs could be shared, the time of samples going back and forth could be reduced, and we could focus on fit. If we take back this part of the cycle, the clothing will cost a tad more and the cycle may take longer, but the consumer will have a selection of good-fitting garments, which two-thirds of customers do not feel they have now. Producing beautifully-fitting designs is just as sustainable as using less pesticides, conserving energy, and paying fair wages to our overseas sewers. Producing beautifully-fitting designs will create less returns, less chargebacks and more pleased consumers who will keep their clothing longer because they appreciate the flattering fit. As you sit and strategically source, market and plan your next line, consider strategically fitting this next line as well. Your customers and our earth will thank you.